Madrid is the cultural heart of Spain. This vibrant, dynamic metropolis creates a lively city-scene with world-renown museums, shopping, nightlife, upmarket restaurants and more. 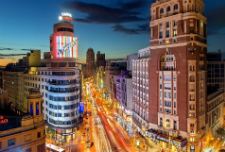 Being located in the exact geographic centre of Spain, Madrid is the country’s multicultural core, with a diverse population and some of the finest restaurants, stemming from all ethnicities... and a gourmet hub offering all of the country’s regional dishes. The city also reserves a small-town charm with several distinct neighborhoods hidden among the city’s main areas. Madrid has a fabulous city layout; many of its main sites being located within walking distance of the central area. Absorbing the city’s street scene is a big part of Madrid’s charm. There are countless 'little things' that make Madrid memorable, welcoming, fun and exciting. This city is somewhat traditional, somewhat modern... and never, ever dull. Madrid's pleasant climate can be enjoyed all year round (you may need a hat and gloves during the evenings in the winter), with beautifully warm weather between May and mid-July​; temperatures at these times are between.